To start you will need a mannequin; Cynthia Howe’s mannequin is used in this tutorial. 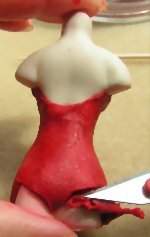 Soft Fimo, colour of your choice, I used a sparkly red but be careful if using the red as it comes off on your fingers and the porcelain, just use a cotton bud and some water to clean it off when you are done making your corset and BEFORE baking. 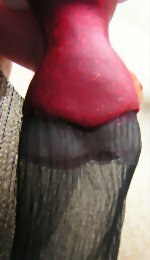 Black crinkle silk, black tulle/net, black lacet ribbon or similar, small piece of black lace and jewel of your choice for the necklace, red rose. 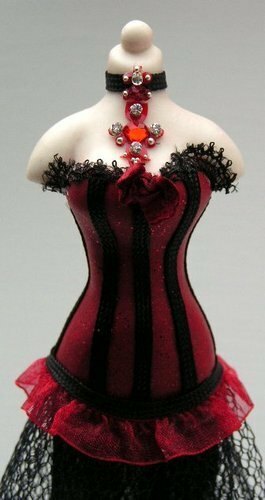 Take you mannequin and fimo and place around the body to form a corset shape, when the body is covered cut off the excess fimo, then with the inside of your finger or using the tool of your choice smooth out all the fingerprints in the fimo. Then bake according to your fimo/clay instructions. Take you crinkle silk or the fabric you are going to use and place it on the glue, I wrapped it around twice, cut off excess fabric at the centre back. I left the ends of my fabric unhemmed. Cut two pieces of net or fabric of your choice, cut one 2 inches wide and the other 2 and a half inches wide and glue into place as in step 2. Don’t worry about making a mess with the glue it will be covered up. 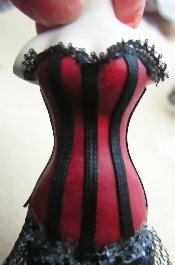 Glue a tiny piece of black lace along the top of the bodice, then draw a bone line in pencil, put a very thin line of glue down your lines, then add lacet braid or braid of your choice to give the illusion of seams/boning. At the same time glue a piece of braid around the neck. Glue some ruffled organza trim or ribbon around the bottom of the bodice to hide your glue lines, glue another piece of lacet braid around the base of the corset. Decorate the necklace with some jewels of your choice; place a rosebud in the middle of the bust or any other decorations you may like to use. © Mary Williams 2008 not to be reproduced without permission, for personal use only.